The latest Gross Domestic Product (GDP) numbers from China proved that again. The Chinese economy expanded by an amazing 11.9% in the first quarter of 2010. Yup, 11.9%! That is a gangbuster number, and it is a big improvement over the 10.7% growth rate in the fourth quarter of 2009 and 6.1% during the same period last year. That is also the fastest pace of growth in three years which means that the Chinese economy is firing on all cylinders and back to the smoking hot growth it enjoyed before the global financial meltdown. The statistical evidence is really starting to pile up. Urban fixed-asset investment (factories, roads, housing) rose 26.4% in March from a year earlier. That’s on the heels of a 26.6% boost in February. Chinese business owners and investors don’t invest unless they are confident that business is going to get even better. According to the China National Bureau of Statistics, retail sales increased by 17.9% in the first three months of 2010. Chinese consumers are confident, prosperous, and spending. Industrial production increased 18.1% year-on-year in March, which means that Chinese factories are flushed with orders. Sometimes it is hard to put statistics into perspective so it is useful to see how those numbers translate into real corporate profits. The most recent example is from Yum Brands, the restaurant giant that operates Pizza Hut, KFC, and Taco Bell. Yum Brands has more than 34,000 restaurants around the world, but more than half of them are outside of the U.S. and 3,500 of them are in China. Last Wednesday, Yum Brands reported 59 cents per share of profits, well above the 53 cents Wall Street was expecting. The source of those better-than-expected results? China! Same-store sales in China increased by 4% in the last quarter, which shows that business is getting better all the time and it plans to open 500 more stores in China in 2010. Yum Brands is one American company that I am delighted to see when I’m traveling the back roads of China because meal time can turn into a game of gastronomic Russian roulette. Why? I can tell you from personal experience that a fat, hungry American that can’t read Chinese is playing with fire when it comes to dining out in China. I’ve been offered grilled scorpions on a stick, dog stew, stir fried monkey brains, grilled cow sphincter, deep fried chicken feet, and lots of other things that I couldn’t begin to identify. That is why I breathe a huge sigh of relief whenever I see a restaurant that I know offers American food. Fortunately for me, there are thousands of KFC or Pizza Hut restaurants found all over China. Chinese consumers can’t get enough of American fast food. Yum Brands, the parents of KFC, Taco Bell and Pizza Hut, is the largest restaurant chain in the world with over 34,000 stores, but more than 14,000 of them are outside the U.S. and concentrated in Asia. In China alone, Yum operates more than 3,500 KFC and Pizza Hut stores. Every Asian city I’ve ever visited has dozens of KFC and Pizza Hut restaurants and they are always packed, often with waits of more than an hour no matter what day of the week or time of day. The Chinese love everything American; our movies, music, clothes, and food. China has four million restaurants, seven times as many as the U.S., and China’s 1.3 billion people spent more than 1 trillion yuan (US$126 billion) dining out last year, a 13% increase from the previous year according to the Chinese Ministry of Commerce. Since 1978 when China first embraced capitalist economic reforms, restaurant spending has increased from an average of 6 to 800 RMB last year. Over the last 15 years, restaurant sales have increased by more than 10% a year. You may not think of the restaurant business as an explosive growth industry, but it absolutely is in China. One of the best ways to profit from China’s free-spending Chuppies, and Yum Brands is cashing in big time! According to A.C. Nielsen, KFC is the top consumer brand in China, even ahead of Coca-Cola and Nike! You see, very few Chinese will ever have the chance to set foot in the U.S., so for most Chinese, dining out at KFC or Pizza Hut is as close as they will get to visiting America. Get this: The swarm of customers waiting to get into the grand opening of a new KFC in Qiandaohu was so thick that eight security guards had to be brought in to help manage the crowds. “This happens every time KFC opens a new store,” says Wang Weiming, manager of the Qiandaohu KFC. Plain and simple; the Chinese love KFC and Pizza Hut. The reason is that Yum has been able to take advantage of the Chinese’s love affair with American products yet tailor them to local tastes and tailoring their menu to the Chinese market. The menu is different from the United States, featuring smaller-sized meals and new entrees with desserts and ingredients well liked by the locals. For example, at Chinese KFCs, you can get a Beijing Duck Wrap served with scallops and hoisin sauce, chicken skewers that come with the cartilage, shredded pork soup, and congee (rice porridge). 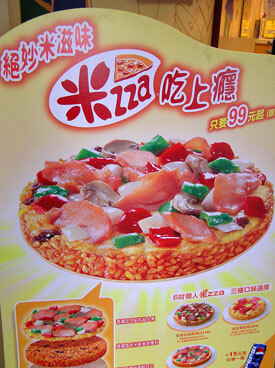 In parts of Asia, sushi pizza is all the rage. China’s eight main regional styles of cuisine vary widely. Sichuan food, for instance is very spicy and a longer grained rice in used in southern China while a short-grained rice is used in the north. Pizza Hut takes that localization strategy even further. In Taipei, they serve sashimi pizza, in Kualu Lumpur the locals love chicken satay pizza, in Shanghai, sea eel is #1, while as unbelievable as it sounds, the Thai people love to dollop a can of tuna fish on top of their pizza. The packaging is American, but the tastes are definitely Asian. Plus, the Chinese consider KFC and Pizza Hut to be more of an upscale restaurant and not “fast food” like we do. The restaurants are bright, lavishly decorated, and have impeccably clean bathrooms, which is why young Chinese men hoping to impress a date often take them to KFC or Pizza Hut. Yum Brands has just hit a new 52-week high and I recommend you wait for a pullback before you jump in, but its strong results are an excellent example of how the booming Chinese economy is driving corporate profits. And a roadmap of how to make a bundle of money in the stock market.